Nestled between Pays-d’Enhaut, Gruyère and the Riviera, the magical resort of Col des Mosses in the Vaud Alps benefits from an exceptional setting. Developed on an area of marshland, called “la Mosse” by the people of Ormont, this relaxing, magical walk is an invitation to linger. Starting from the tourist office, head for the crossroads between the cantonal road and the camp site road to access the footpath. This fairly flat family walk in an enchanting setting, on a sunny plateau, can be enjoyed on foot, on sledges or even with a buggy. Between typical chalets with their authentic architecture and mountains on all sides, the first undulating but slightly downhill section will take you through meadows and woods to La Lécherette. The route crosses a vast piece of marshland listed as a site of national importance and the small village of La Lécherette is known for its legendary Lake Hongrin. Perfect for a refreshing rest stop. Return by the same route via the L’Arsat snack bar to Les Mosses. The route is marked with pink signs. Trail can be started from La Lécherette or L’Arsat. In the heart of the Vaud Alps the Leysin-Les Mosses-La Lécherette ski resorts have 100 kilometres of groomed pistes between them. 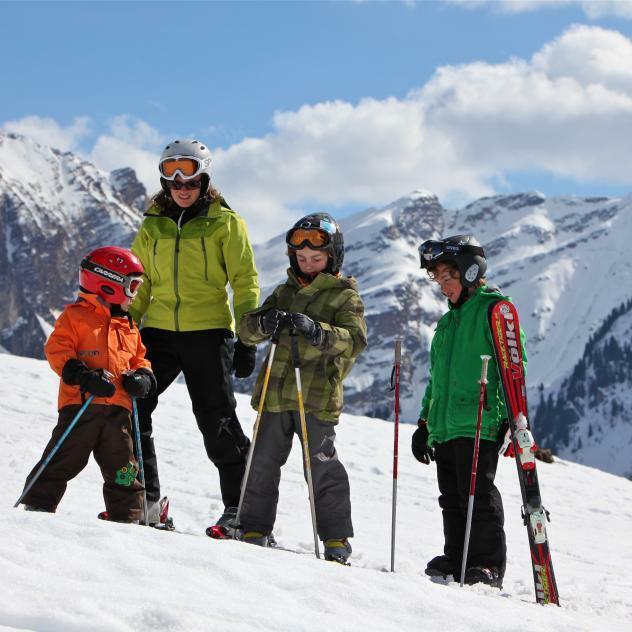 On both skis and snowboards adults and children alike go crazy for snow sports !